Remember Mel Gibson in Braveheart? In his younger pre-fringe lunatic days? It pains me to say it, but the man looked good in a kilt. 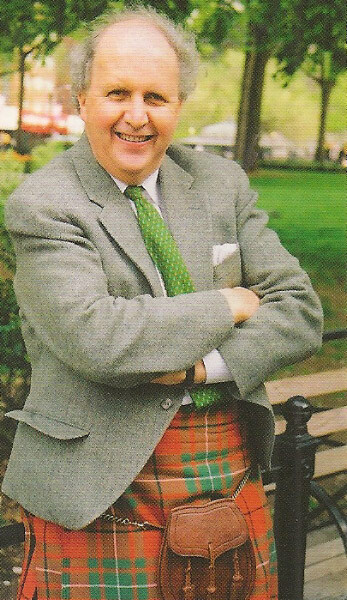 It’s not a fashion choice everyone can carry off, but it also suits Alexander McCall Smith. There is something gentle and humorous about his expression in the photos that grace the back covers of his books, a look that reflects his worldview: calm, observant, intelligent, and very, very interested in people and ideas. Not only that, but in at least in one of those photos, the man wears a kilt with perfect aplomb. With the exception of The No. 1 Ladies Detective Agency series, which I found less engaging than all the others (despite the exotic background of Botswana), one has the feeling that nothing truly bad happens to any of these characters in the books. Which isn’t really the case… hearts are broken, careers are lost, egos are crushed, important connections are missed, and pharmaceutical data is falsified with serious consequences, but McCall’s treatment of these events is so gentle, so considered that while we may be moved, we are not deeply troubled. There is still an overall feeling of lightness about the books. Many of his novels are ensemble pieces, in which the reader alternately follows the fates of the various characters. And eccentrics who might be found irritating or even alarming (Lard O’Connor, a gangster in the 44 Scotland Street series is a brutal man, but we see him in the context of his friendship with a young boy, a prodigy, who in turn is deeply endearing, and the victim of his hovering mother’s ambitions) are charming on the printed page. Smith seems to know a little bit about everything, wine, art, poetry, astronomy, psychoanalysis and philosophy and shares his thoughts and questions on these subjects in engaging tangents—without being pedantic. His books are both literate and profoundly entertaining. And just a little bit haunting. Certain phrases and images linger: the notion that poetry helps keep “the nothingness at bay”, the moment when two young characters in the 44 Scotland Street series really see each other as full human beings. The return of a dog to his curmudgeonly owner after a failed kidnapping is as touching to me as any reunion between fictional lovers. Note: While doing a bit of research, I came across this site, created by a group dedicated to liberating men from the “tyranny of trousers”, an organization one might well find in one of Smith’s novels. Proponents of the movement advocate the wearing of MUGS—Male Unbifurcated Garments—instead of pants. Now anything about kilts and men in dresses makes me think of the Scythians. You see, your posts are very evocative!